Here in Shropshire, we are among the country’s top performers in raising cash from car parking. That’s the verdict of the RAC Foundation. Of the 353 local authorities in England, only 57 have made more from car parking than Shropshire over the last five years,after essential costs are deducted. The Foundation says that Shropshire Council made £2,751,000 after running costs in 2015/16. Between 2011/12 to 2015/16, the council took in £13,564,000 over and above that needed to cover its costs. Those making more money than us are London boroughs like Westminster or Camden, or tourist hotspots such as Bath and Brighton. I can’t verify the RAC Foundation information because Shropshire Council doesn’t publish data that the government insists it must. For years, the council has shied away from telling council tax payers how money is raised from parking and how it has been used. Government rules state that every council is required to publish the data annually under the Local Government Transparency Code 2015. Every citizen of Shropshire should be able to find out with the click of mouse how much is raised from on-street and off-street parking and penalty notices and how that is spent. But Shropshire Council has ignored the transparency code. What do we know about how much money is raised and where has this money gone? I really don’t know and I’ve been pursuing this information without much result. In September 2016, I made a freedom of information request with the aim of extracting the data. 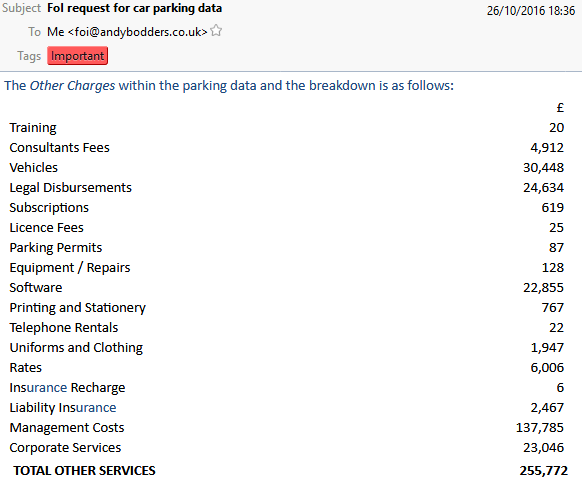 I asked for the car parking accounts for 2014/15 and 2015/16. They were not supplied. Neither were they published online. So much for the transparency code and freedom of information! The 2013/14 parking data, which only cover on-street parking, show a revenue of nearly £1 million. Of this nearly half a million was used to pay Shropshire Council staff. A further £256,000 was allocated for “other costs”. I spent a good while trying to resolve this and got an answer that the “other costs” were for staff and related expenditure. So, in 2013/14, nearly £800,000 was spent on administration and management charges. The remaining £133,300 was split between public transport schemes (£124,510) and environmental improvements (£8,790). No information on income from off-street parking is provided. At the 12 July meeting of the council’s cabinet, Labour leader Alan Moseley and Lib Dem leader Roger Evans asked Shropshire Council how much extra money will be generated by the new parking strategy if implemented. The answer from the chief executive was that the figures haven’t been worked out. It will depend on the options selected. While that will be the case, it is best practice in any organisation to cost policies and strategies at every stage of development. I am sure the council will have a spreadsheet with the estimated financial outcomes for each of the options. The chief executive told cabinet that he was expecting to “raise at least as much and probably a surplus.” He wouldn’t have said that if estimates for income did not exist. They should be published. If estimates really don’t exist, they should be generated and published. The law is clear that money raised from parking charges can be only be used for administering the car parking scheme – including slapping fines on miscreant motorists – and for broader transport and environmental services. This raises the spectre of towns like Ludlow losing trade from the proposed higher charges but getting nothing in return. The consultation on parking strategy runs until 17 October. I can’t see how we can respond in detail until we have costed proposals. We have had costs for almost all draft council strategies before. We should have them for the parking strategy.
. Car parking income in Shropshire after essential costs: 2011/12: £2,629,000. 2012/13: £2,334,000. 2013/14: £2,692,000. 2014/15: £3,158,000. 2014/15: £2,751,000. Full RAC Foundation data.
. The Traffic Management Act 2004 recommended that authorities undertaking civil parking enforcement should produce an annual report about their activities. The Local Government Transparency Code 2015 made the annual report mandatory, saying at paragraph 46: Local authorities must publish on their website, or place a link on their website to this data if published elsewhere: a breakdown of income and expenditure on the authority’s parking account; the breakdown of income must include details of revenue collected from on-street parking, off-street parking and Penalty Charge Notices, and breakdown of how the authority has spent a surplus on its parking account.
. The only data published for Shropshire is for 2009-2013 and 2013/14. The reports do not include income from off-street parking.
. The discussion of the car parking strategy begins at 20:30 in this video.
. Section 55 of the Road Traffic Regulation Act 1984 limits the uses to which income from parking charges can be put. The law was clarified in a high court case between Attfield and Barnet Council. Building on this case, auditors Grant Thornton told North Dorset Council in May 2015 that it could not proceed with its policy of increasing car parking charges to fund general services. The auditors said: “The RTRA does not give councils the power to raise money from off-street parking charges for use on general services and therefore it is not lawful for councils to seek to raise a surplus from off-street parking charges to fund other services.” Section 55 says that the council should use the money for improving off-street parking. But if that is “unnecessary or undesirable” the money can be used for public transport or highways and environmental improvements. Environmental improvements allowed under S55 include: reducing environmental pollution; improving or maintaining the appearance or amenity of a road, land near a road, or open land or water to which the public has access; the provision of outdoor recreational facilities available to the public without charge. Those wishing to explore this topic further will find these briefings useful: Parking policy in England; Operational guidance to local authorities: parking policy and enforcement.
. It is notable that this statement does not include any reference to electric charging points. What is the penalty for breaking the mandatory code 2015 and how would you instigate enforcement action? But for what else does any Con Council see us plebs for, other than to be bled dry … far more of a deadly effect on us than being mere cash cows, albeit for Shropshire’s rural status? The important aspect of this issue is not financial, it’s the point that H raises. Again SC ploughs it’s own furrow, again the public are faced with questions, asked by residents and SCs own councillors, that will not be answered. I absolutely agree, Heygate, as I too have increasing problems getting answers out public bodies these days (not just SC), but as the general situation created by the arrogance of the Con Gov has effected general costs, I can no longer afford to be a cash cow, let alone be bled dry … and I am sure they haven’t stopped yet.